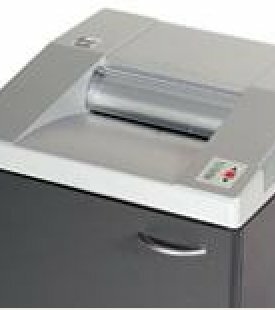 The GBC Shredmaster 3890D Micro Cut Office Shredder - The GBC Shredmaster 3890D Micro Cut Office Shredder is a medium duty micro shredder offering the ultimate in security and bulk reduction. It is ideal for a small company or department. A continuous duty motor never needs a cool down period. It holds a 9 1/4" throat with a deep, funnel shape, which simplifies paper feeding by accommodating oversized sheets and disorganized stacks. SmartShred visual indicators keep the operator informed. 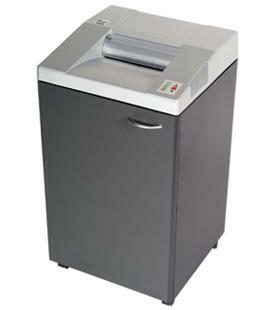 JamStopper Electronics help maintain a longer shredding period. The Shredmaster 3890D Micro Cut Office Shredder also holds solid one-piece cutters, bag full shut off, and automatic stop on jam capabilities. Convenient in cabinet storage keeps shred bags handy while casters provide mobility. * Throat Width-9 1/4 "
* Shred Size (Inches)- 1/26" x 1/5"